With the growing interest in physics and bladesmithing has come the increasingly popular sport of knife throwing. Knife throwing is the art of propelling a knife in such a way that it hits and pierces the target being aimed at. If you’ve become fascinated with knife throwing and have intended to play this sport right, you’ll need to consider which knives are the best option for proper throwing. Luckily for you, we decided to do the work ourselves and put together a complete buying guide and review for your benefit. DURABLE: Blade is made of reliable 2Cr13 S.S.
Out of the throwing knife sets we reviewed, the Smith & Wesson set of 6 Throwing Knives was our favorite. These knives come from one of the most well-known weaponry manufactures since the mid-1800s, Smith & Wesson. This company is known for well-made, dependable, and lasting weapons, and this throwing knife set is no different. Although this isn’t the cheapest set on our list, it’s still quite affordable, even for those who aren’t looking to spend much on a sport they may or may not enjoy. Not only does this set come with 6 throwing knives, but it also comes with a protective sheath for safe keeping. Additionally, these knives are extremely well-balanced complete with balance slits, making them perfect for those looking to achieve better control over their throws. The sturdy, yet pliable metal they’re made of is easily shaved or shaped, if needed, to better suit your preferences. The set comes with 6 throwing knives at a reasonable and affordable price. They’re made by a weapons manufacturer that has been trusted for nearly 200 years. Knives come with a protective sheath for proper storage. Knives are constructed with balance slits to make them easier to control. The metal material of the knives is sturdy, yet able to be shaved to meet your preferences. As with many throwing knives, these knives may break if thrown too violently. 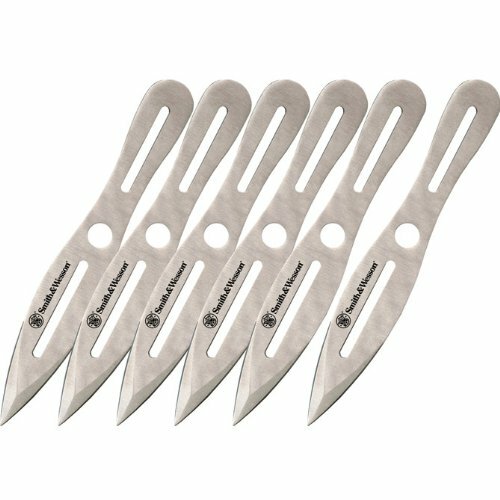 The Perfect Point RC-179 Series Throwing Knife Set is not only the most affordable, but it’s also an incredibly durable and well-balanced choice. The 3.5-inch blades (all-inclusive 8-inch knives) are a suitable length for an ideal knife penetration and the larger handles are great for increasing gripping ability. The overall form of these knives is perfectly suited for those who are new to the art of knife throwing. 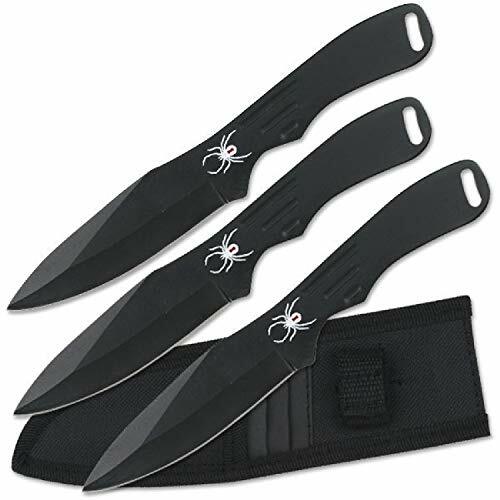 This knife set is also available in three different colors to choose from (all with a spider logo at the base of the blade): black, black and silver, and silver. So, on top of the set being the most budget-friendly, altogether well-balanced, and durable, you get to choose which style of blades suits you. The affordable price, which is great for those not looking to spend a pretty penny. The three color options to choose from. The comfortably-sized handle for better grip. The well-balanced design of the knives. May warp sooner with everyday use compared to more expensive options. The United Cutlery Kunai Thrower Set has been commended for being one of the sharpest, most reliable throwing knife sets on the market today – even with long-term, abusive use. Not only are these knives unbelievably sharp and solid when it comes to rough throws, but their length is comparably superior to other throwing knives available. From the bottom of the handle to the tip of the blades, these knives measure to 12 inches long; a pretty noticeable size difference compared to most throwing knives. 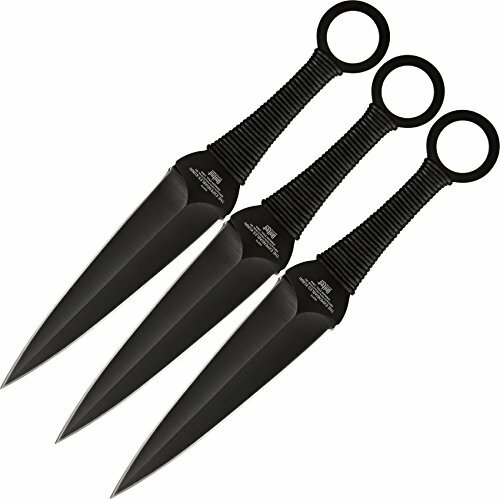 The large size of these knives makes this set great for knife throwers of any skill level and build, as the handle is far easier to hold on to than the handles of much smaller knives. 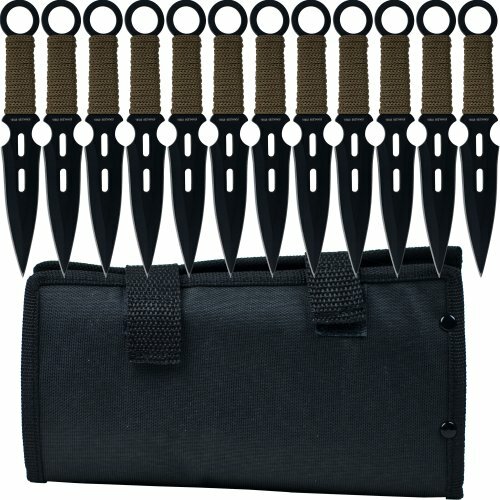 Furthermore, this throwing knife set comes with a nylon belt sheath complete with a leg strap and belt loop to hold your remaining knives in an easy-to-access position as you practice or compete. Very sharp blades for effortless penetration of targets. Durable and long-lasting even with constant abuse from hard throws. Large, 12-inch knife set from end of the handle to tip of the blade. Easy handling and better grip than many other throwing knives. Belt sheath with leg strap and belt loop for easy knife access. Cord-wrapped handle comes undone with throwing. 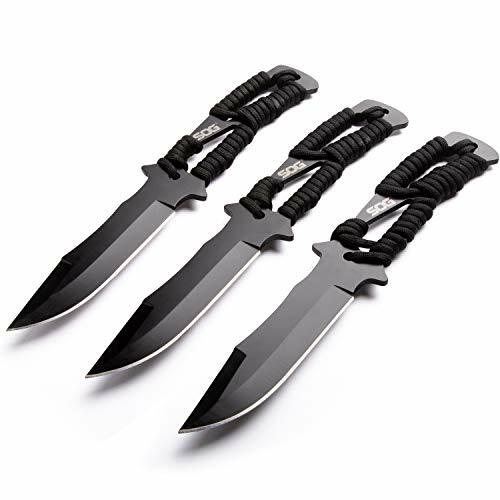 The 3 Pack SOG Throwing Knives Set is yet another highly rated and praised knife throwing set by users. The blades measure 4.4 inches long, with an overall length of 10 inches, which makes this knife on the larger – and more easily controlled – side of throwing knives. This set is made of stainless steel, making the knives more durable than knives made of softer metals. In addition to being durable and despite their size, these knives are also lightweight and exceptionally sharp – which makes throwing a breeze and piercing the target uncomplicated. Not to mention, the handles are wrapped in removable paracord so you can customize the amount of grip you have. The larger handle for better control. Removable paracord for better grip and customization to your preferences. Exceptionally sharp blades for simple target puncturing. Stainless steel build for a more durable set of knives. Though the paracord provides a better grip, it may come undone when thrown. The Whetstone Cutlery 12 Piece Kunai Knives Set is the largest set of throwing knives on our list. With 12 individual throwing knives, this set is sure to last for quite some time. The knives are made with stainless steel for durability, and the blades are double-edged, 3.125 inches in length; making them perfect for effortlessly impaling targets. These knives also come with a carrying bag with velcro straps to keep the handles firmly in place, as well as corded handles for better grip. 12 knives at the second most affordable price on our list. Made of stainless steel, which means better quality knives. Blades are double-edged for effortless target impaling. Knives come with a velcro-strap carrying bag. Cord-wrapped handles make for better grip when throwing. The cord may come undone after multiple throws. Kunai Knives: Kunai knives are Japanese-style throwing knives usually used by incredibly skilled knife throwers. These throwing knives are sharper than most throwing knives, which allows them to pierce targets (even harder targets such as wood) with ease. Balanced Knives: Balanced knives are great for beginners, as the weight is evenly distributed through the blade and the handle, making the knives great for shorter distances and increased control of throws. Blade-heavy Knives: Blade-heavy knives are generally the best throwing knives for beginners to start out using. The weight of the knives center on the blade which forces the blade forward and makes for easier penetration of the targets. These knives are usually thrown best at up to 5 meters. Handle-heavy Knives: Throwing knives that are handle-heavy are best used by advanced knife throwers, considering the weight is centered disproportionally on the handle end. These knives are another kind that is commonly used for long distance throws up to 5 meters. The type of knife you’ll need depends heavily on your skill level and how far you’re wanting to throw. If you’re a beginner, ideally you’ll want to choose a blade-heavy set of knives. Although, balanced knives are another great option for beginners to practice with. On the other hand, if you’re more proficient in your knife throwing skills, Kunai knives and handle-heavy knives may be a better option when considering throwing knife sets. When considering purchasing anything, the cost is one of the most important aspects to keep in mind. It’s important to figure out before you start shopping what your budget is for throwing knife sets. Ask yourself if knife throwing is something you simply want to try or a sport that you’d like to master. From there, you need to take into account that extremely well-made, professional throwing knife sets are not always budget-friendly and extremely low-priced knife sets aren’t always worth the money. That said, you can definitely find worthwhile sets for less than a hundred dollars, such as the few we’ve listed, that are sure to last you quite some time. When choosing a set of throwing knives, it’s crucial to understand the weight-to-length ratio. Ideally, throwing knives should be 1.5 ounces per inch of the knife. That way, a longer 12-inch throwing knife throws without wobbling and keeps you from having to toss the knife harder to get it to pierce the target. A knife that is too heavy for its length, or too long for its weight will be more difficult to throw accurately. The center of balance of a throwing knife differs from set-to-set. Some throwing knives have their center of balance in the middle, while others are more off-balanced. For you to determine which center of balance is best for you, we recommend visiting a knife throwing class or practicing with variously balanced knives with a friend who has experience. See the link above for more information. The size of your throwing knives largely depends on personal preference. On average, experts recommend purchasing knives that are 10-12″ or 12-16″. Again, whether you buy 10-12″ or 12-16″ throwing knives is completely dependant on what suits you and your throwing style best. It may be a good idea to practice with variously-sized throwing knives to get a feel for what’s best for you. Now that we’ve gone over the details of each set of throwing knives, and what to look for before purchasing, let’s take a look at our top picks again and their manufacturers. BladesUSA: BladesUSA is a weapons manufacturer known for making various throwing knives and Asian-Style weapons. Smith & Wesson: Smith & Wesson is by far one of the best and most trusted American weapons manufacturers. Since 1852 consumers – from Western-Era cowboys to modern-day hunters and homeowners – have stood by the durability of Smith & Wesson guns, knives, and other weapons. For nearly 200 years this company has perfected the trade of making weapons for self-defense and sport. United Cutlery: United Cutlery is a weapons manufacturer founded in 1984. They strive to produce a variety of knives and swords made of durable materials, good quality, superior performance – all at affordable prices. SOG Knives: SOG Knives is a weapons manufacturer founded in 1986. All of their weapons are made in the USA, supporting American workers and consumers. This company is best known for their military-style weapons, such as their famous SOG Knife from the Vietnam Era. Whetstone Cutlery: Whetstone Cutlery is known for their variously-styled, dependable, sturdy, and well-designed fixed-blade and folding knives. We believe that all of our choices would make great throwing knives for both beginners and experienced knife throwers. After research and listing the best throwing knives we could find, we decided that our favorite was the Smith & Wesson set of 6 Throwing Knives. The affordable price, durability, ability to shave or shape the metal, and balancing feature seem to make these the ideal knives for knife throwers of all skill levels. Not to mention, you’ll be purchasing from the same manufacturer that made guns and knives for the American outlaws, lawmen, and average-Joes of the Western Era. We’re not too sure it can get any cooler than that.